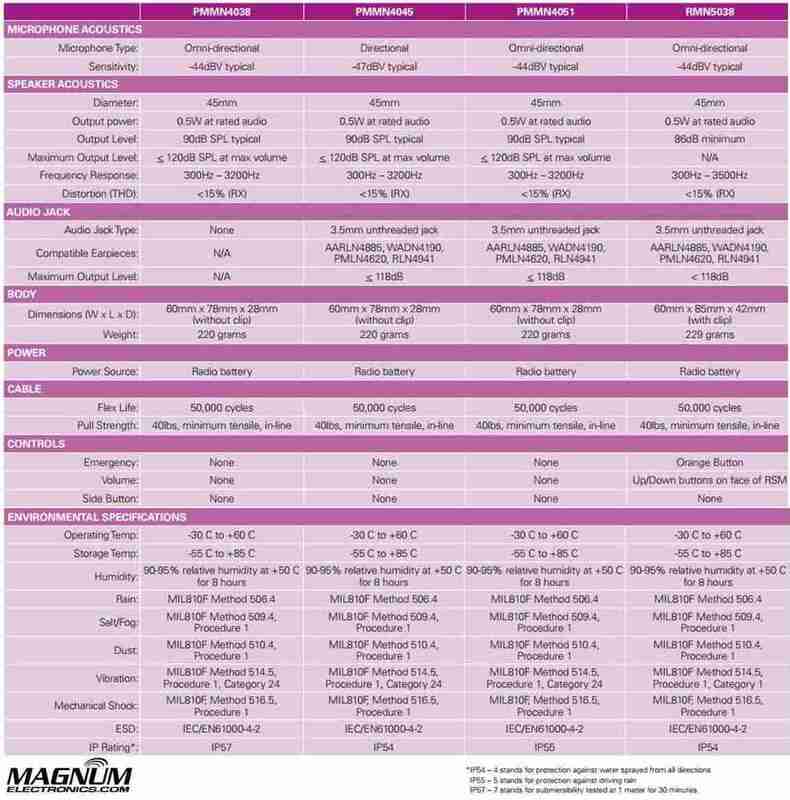 How to Choose the Best XTS Radio Microphone | Magnum Electronics, Inc. 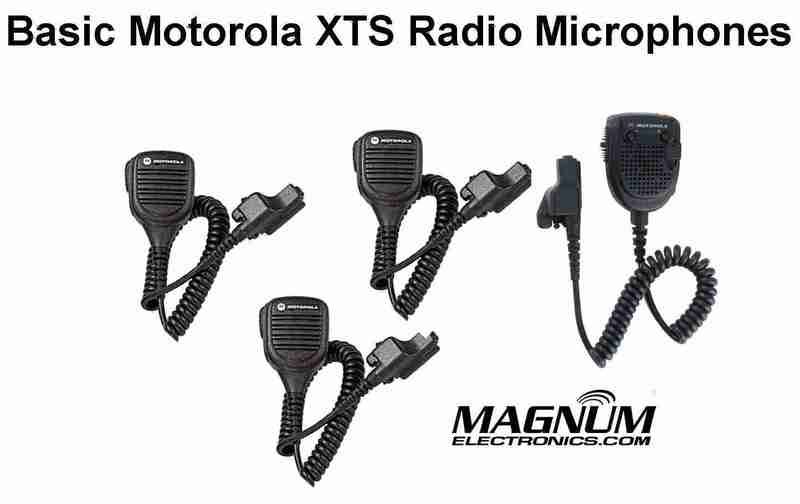 There are four basic Motorola remote speaker-microphones with the XTS series 2-way radio audio connector. These basic microphones are compatible with the XTS5000, XTS3000, XTS2500, XTS1500, PR1500, MT1500, MTS2000, MTX8000, MTX9000, and HT1000. Each microphone has different features that may be important for police, firefighters, and EMS applications. All include a spring clip on the back and heavy-duty six foot coiled cord. If you are a firefighter who could get very wet the Motorola PMMN4038 may be the best choice. This microphone is rated IP57 meaning it can withstand being under 3 feet of water for 30 minutes. To accomplish this rating it lacks a 3.5mm audio jack. Other than submersibility, it has identical specifications as compared to the PMMN4051. The PMMN4045 includes a directional noise-cancelling microphone that reduces background sounds. Use this microphone indoors to improve message clarity by reducing overhead loudspeakers or outdoors to minimize siren noise .This noise cancellation is in addition to Motorola’s windporting feature that reduces clarity due to high wind noise. For best performance, make sure you speak directly into this microphone from about 2 inches away. The PMMN4051 is the most popular and the standard for general use applications. It has an unthreaded 3.5mm receive-only audio jack on the side of the microphone head and another threaded 3.5mm jack on the radio connector. Receive-only accessories are good when working in high noise environments or when you want your communications to be discreet because the speaker mutes when plugged in. The 3.5mm unthreaded receive-only audio accessories with short 7-9 inch cords (RLN4941) plug into the microphone head. A threaded 3.5mm receive-only accessory like the RLN5313 with the long 36 inch cord is compatible with the 3.5mm jack on the connector. It also includes Windporting technology. 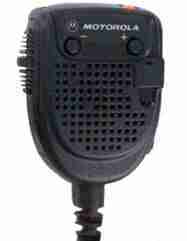 The Motorola RMN5038 microphone head is slightly larger and includes a 3.5mm audio jack, volume controls, and orange button. The orange button duplicates the emergency button on the radio but it can perform many other functions using the radio programming software. The RMN5038 is similar to the Commander II RMN5067 and RMN5089 that are only compatible with the XTS5000/3500/3000. The 3.5mm unthreaded audio jack is compatible with many styles of receive-only accessories. It carries a IP54 rating meaning it can be splashed with water for 10 minutes with no harmful effects.The omni-directional microphone picks up sounds equally from all directions. This entry was posted in Motorola, Portable Radios and tagged 2-way radio, communications, ems, firefighters, microphone, mission-critical, P25, PMMN4038, PMMN4045, PMMN4051, police, RMN5038, XTS by magnumelectronics. Bookmark the permalink.